You'll need a professional and easy-to-use AVI to TS converter to convert an AVI video file to the TS file format for a better playback on a HDTV or other .TS supported devices. Wondershare UniConverter (originally Wondershare Video Converter Ultimate) is highly recommended to help you with that and much more. It features powerful conversion capability, excellent output quality and unparalleled conversion speed. At the same time, its also embedded with an in-house editor that can help you to touch up videos instantly for better playback experience. Convert AVI to TS, MOV, MP4, and other 1000+ formats. Convert AVI to optimized preset for almost all of the devices. Download/record videos from YouTube and other 10,000 video sharing sites. Versatile toolbox combines video metadata, GIF maker, cast video to TV, VR converter and screen recorder. Both of the two versions (Windows and Mac) share the same features. However,this guide will be based on the Windows's screenshots. Step 1 Add AVI files into the converter. To import your AVI files, you can click the Add Files icon to locate your AVI files or simply drag them directly onto the program window. Note: Batch conversion is supported, so you can add as many files as you like. After that, you can change the file order, change the output name and double-click to view them on the right screen. Step 2 Select your output format as TS. Click the down arrow icon to expand the output format list, click the Video tab and choose TS from the left side bar, and then select the video resolution in the right to confirm the output format. Tips: Click + Create Custom at the bottom of the interface if you would like to change or adjust the parameters for the video or audio including encoder, frame rate, bitrate, resolution, etc. Step 3 Edit AVI files before AVI to TS conversion. 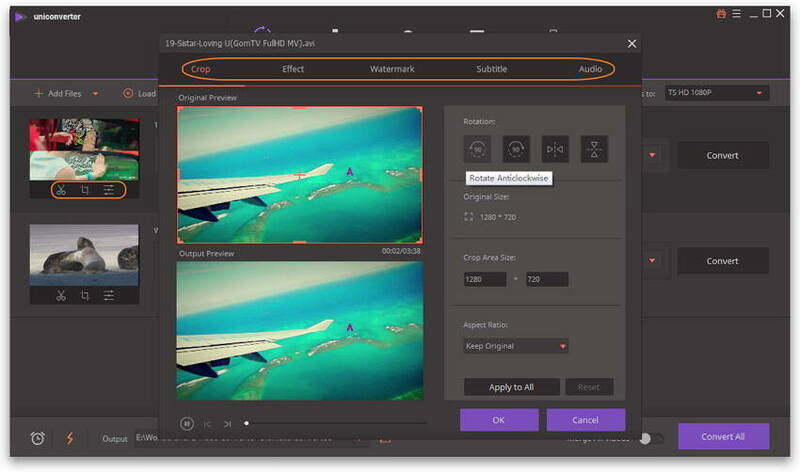 If you want to trim your AVI video to a desired length, add watermark or subtitle, crop the blank edge or adjust the video effect, Wondershare UniConverter (originally Wondershare Video Converter Ultimate) will be a great help. Just click one of the editing icons under the video thumbnail to get a separare editing window and then refer to edit video. Step 4 Convert AVI files to TS. When all settings and adjustment are done, you can simply click on the Convert button to start the conversion. There'll be a progress bar on the screen that shows you the remaining time required to complete the conversion. 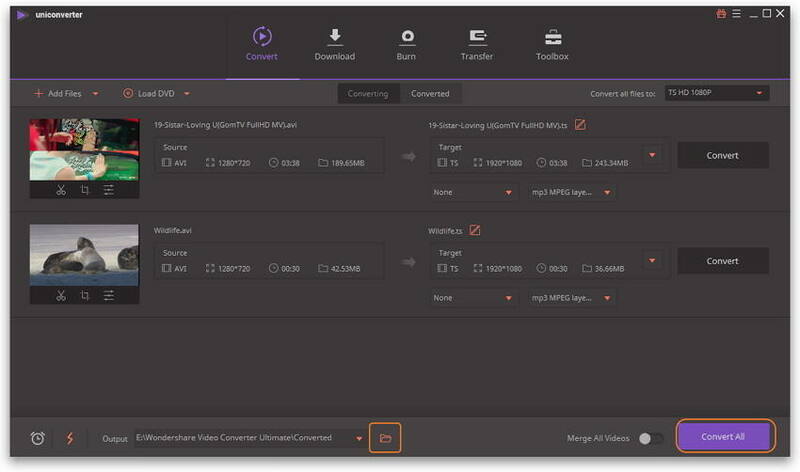 Simply drag-and-drop your files onto the converter and select your playback method, console or devices conveniently with the optimized presets. You can do exactly the same with your downloaded online videos. 1. Common or regular conversion speed. 2. Restricted choice of some advanced features compared to UniConverter (originally Wondershare Video Converter Ultimate). 3. Convert videos or burn DVDs with watermark. If you're looking to convert AVI to TS online, a good way to do it is by using FileZigZag. 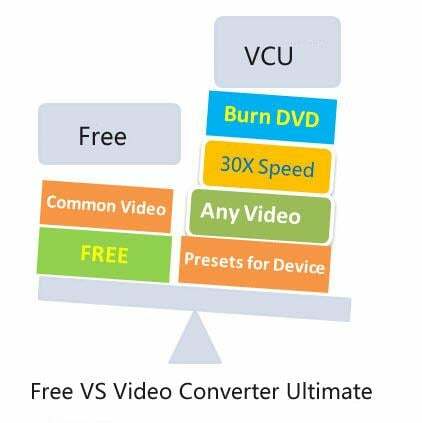 It is an easy-to-use online WMV to MOV converter that can help you convert media files without installing additional software on your computer. Step 1. First, click the Select button to upload your AVI files. Step 2. Next, set TS as your output format from the drop-down list. Step 3. Lastly, enter your e-mail address to receive your converted files. Note: As with any free service, FileZigZag has its drawbacks. Video quality on converted files isn't the best. There is a limit on the file size you can convert (max 100MB), and batch/bulk conversion is not allowed. AVI is a multimedia container that contains both audio and video data. It allows synchronous audio-with-video playback. 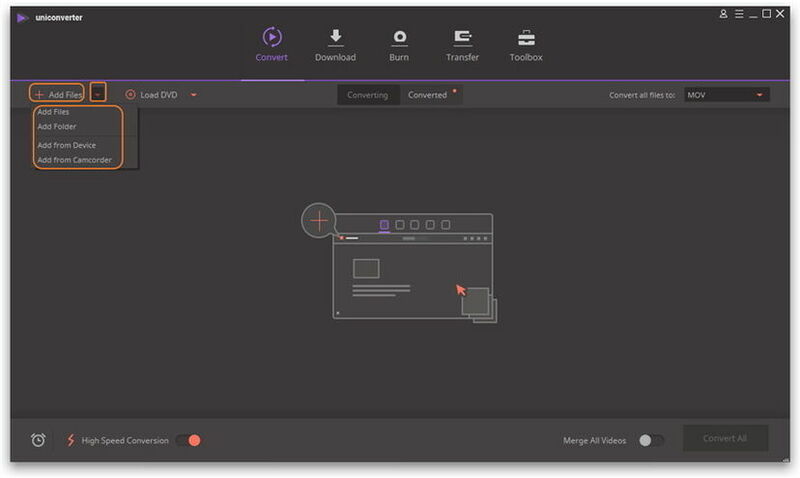 AVI files support multiple streaming audio and video TS is a transport stream (also a media container) used to store video, audio and data that's contained in the MPEG-2 file format.